To make the spider’s head and body, lightly grease a 3.5-litre capacity and 375ml-capacity glass bowl with the oil. Pour the melted chocolate into both bowls and rotate to coat the bowls evenly, using a pastry brush to help evenly coat (see making the dome). Refrigerate for 1 hour or until set. Turn the bowl upside down and cover with a warm tea towel. Slide the chocolate dome from the bowl and set aside in a cool place. To make the chocolate cream cheese icing, place the butter and cream cheese in an electric mixer and beat for 6–8 minutes or until pale and creamy. Add the icing sugar and cocoa and beat for a further 6–8 minutes or until light and fluffy. To assemble, trim the edges of the chocolate bowls to form a clean edge. Place the mixed lollies on a cake board and cover with the two bowls. Using a 1cm plain nozzle, pipe rounds of the icing around the base of the big bowl and all over the small bowl. Knead the black fondant on a clean surface until pliable. Roll out between 2 sheets of non-stick baking paper to 3mm-thick. 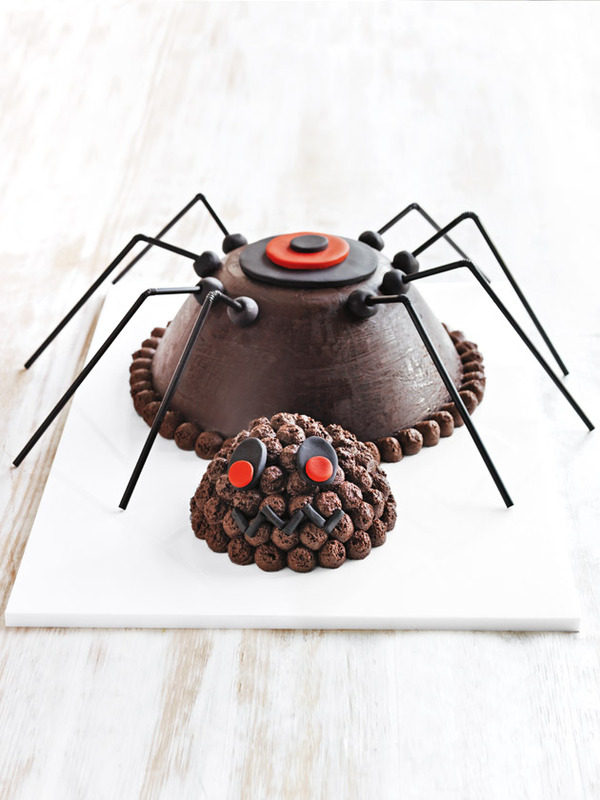 Using round cutters, cut out an 11cm and a 3cm round from the black fondant for the spider’s back. Cut 6 x 1.5cm-long pieces for the mouth. Cut 2 x 2cm rounds and stretch them to create ovals for the eyes. Roll 8 x 1 teaspoonful balls from the black fondant to make the base for the legs. Knead the red fondant on a clean surface until pliable. Roll out between 2 sheets of non-stick baking paper to 3mm-thick. Using round cutters, cut out a 7cm round from the red fondant and 2 x 2cm rounds for the body and eyes. Lightly brush the base of the 11cm black round, 7cm red round and the 3cm black round. Place each piece on top of each other and place on the spider’s back. Place the 1.5cm-long pieces on the head in a zig-zag pattern to create a mouth. Lightly brush the base of the 2 x 2cm red rounds and press onto the black ovals. Press those onto the head for the eyes. Press the black round balls onto the ends of the 8 straws and lightly brush with water. Press around the large dome to create the legs to finish. Serves 10–12. + You can purchase coloured fondant from specialty cake stores.